No amount of skill can predict where the little white ball is going to land on the roulette wheel, so following any kind of strategy isn’t going to improve your chances. Nevertheless, we take a look at the systems which some players swear by, and some important tips to note when playing. 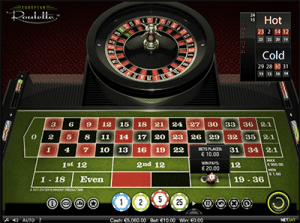 While roulette is a game of luck, there are some tips you can adhere to which will improve your overall gaming experience when playing roulette. While the house edge on roulette doesn’t change too much when it comes to online and offline variants, unlike the pokies, minimum bets do. If you’re a low roller, you may be better off going online as you can find variants which feature smaller minimum bets – as low as $0.10. Minimum bets are around $2 to $5 at land based casinos. Additionally, it is incredibly important to know the odds of the game you are playing – this will improve your chances of winning. French roulette offers the lowest house edge of 1.35%, while European roulette is next offering 2.7%. You can find both of these variants at our recommended online casinos. 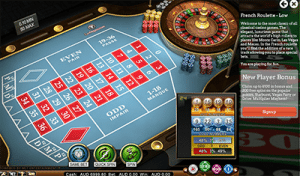 The roulette variant you should avoid however, is American roulette which offers a huge house edge of 5.26%. This is due to the additional betting option of a double zero, along with the 1-36 numbers and single zero. Also, outside bets are generally the best bets to make in the game of roulette due to their even money chance at winning. Now when it comes to betting systems, you can be fooled into thinking they will work – but roulette is a game of luck and no system will help. The Martingale System is the most common system used. Players wager on an outside bet and double their bet size and repeat the bet if they lose. For example, if you place $10 on red and lose you double your bet and re-do the bet – $20 on red. As soon as you win, revert back to your initial wager amount and start the process over. This system is meant to recoup any losses and make a profit, but it doesn’t account for table limits of huge losing streaks. This system is the opposite of the Martingale System – instead of doubling after a loss, you double your bet after a win. With this approach, when you lose, it might be more appealing than forking out double of what you just bet after a loss. However, if you continually double your bet after a win, you will eventually forfeit all you’ve gained when you lose a single bet. Very similar to the original Martingale system except instead of simply doubling up after each loss, you double your original stake plus an additional bet equal to your default wager. For instance, if your starting bet is $4 and you lose, double it to $8 plus another $4 so your next bet totals $12. If you lose again, your next wager amount will be $36. While this increases your potential winnings more than the original Martingale system, bets can escalate quickly and you can use up all your cash fast if you encounter a few unfortunate spins. If you’re on a limited budget, stay away from this one. Also known as cancellation system, this is slightly more complex than the previous systems. Players are required to pick five numbers and write them down, for example, three, four, five, six, and seven. Then they need to add the first and last together, for example 3 + 7 = 10 and the player needs to bet this amount on an even money bet. If the bet wins the two numbers are crossed off the list, if it doesn’t the amount lost is a new number added to the list. This system is meant for higher limit players as it doesn’t account for players who can’t afford to bet after they’ve just lost a big amount. As you can see these strategies don’t account for smaller bankrolls or big losses. Therefore we recommend steering clear of betting systems and instead playing the game the way you want to. Since it is a game of luck, you will find playing real money French roulette without relying on a system will give you the best experience. Stick the outside bets as they have the best odds and be sure to monitor your bankroll – don’t double your wager to recoup losses like these strategies suggest. 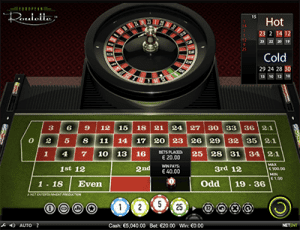 Our top-rated roulette sites are listed in the casino table at the top of this page. We recommend Raging Bull Casino as our top-rated casino site for players from United States, which has some excellent welcome bonuses available for new players along with a nice selection of roulette variants, online slots and other table games.